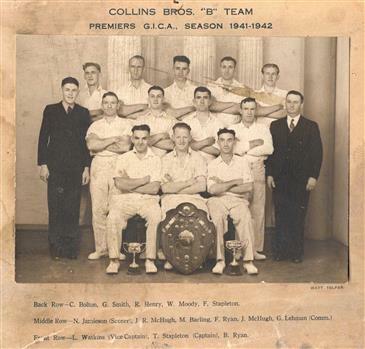 Collins Bros 'B' Team, premiers of the Geelong Industrial Cricket Association, 1941-42. Depicts the Collins Bros Mill "B" Team, premiers of the Geelong Industrial Cricket Association in season 1941-42. Site is now Eltham Fort Knox. This directory has no front or back cover and is held together by its cloth spine. It contains over 1300 pages, however there may be some pages missing front and back of the directory which would have contained advertisements of some unknown shops. All the sides of this directory (except the spine) have advertisements and content information stamped on. 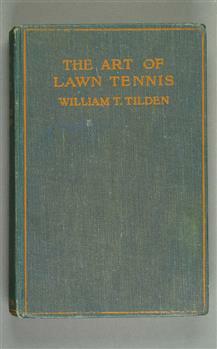 The spine cover has been placed in the directory until further conservation work is carried out. 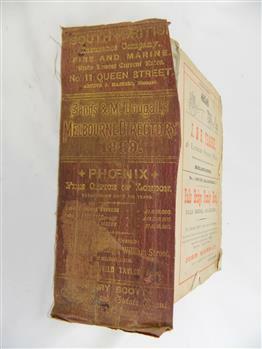 It has gold coloured printing and in the central section, a gold coloured background with the words "Sands & McDougall's Melbourne Directory 1889." The spine has three adverts on the spine. This Directory of 1889 covers the location of Melbourne based trade and professional offices by street and in Alphabetical order. It covers all of Melbourne and its suburbs. It also covers government and official, ecclesiastic, legal, municipal and miscellaneous information. The directory details a cross section of a developing city with a splattering of advertisements opening up an in depth look of all aspects of living in the late 1800s. It is interesting to see that all the advertisements do not have any telecommunication numbers listed (personal shoppers or mail orders only). This was a period of high moral standing within the community and hotels advertised rooms " suites of rooms for families and single rooms for Ladies and Gentlemen" also "electric bells throughout the house. Telephone, night porter and hot and cold baths." This directory would be used by the majority of families and businesses working and living within the Kiewa Valley and the surrounding area. Melbourne was the only place where every aspect of living requirement was catered for. Although the delivery of services and goods were not at a high rate, certain items or transactions would require a visit to "the big smoke". Business information are listed both by suburb and alphabetically. There is also a section for British and Foreign Trade. This directory covered nearly everything to do with commerce, an example pay days for principle firms. Greater evolution of trade locations started to balloon out after the mid 1950's. 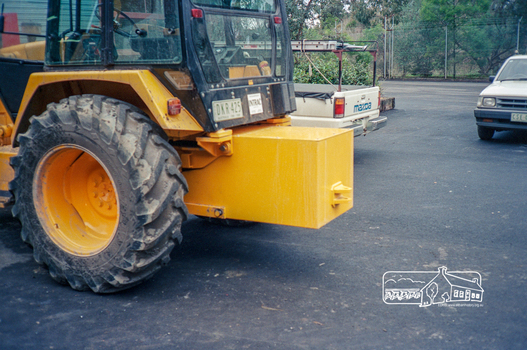 Increased populations and greater levels of communication and safe fast transport facilities permitted greater devolution of commercial enterprises into rural communities, such as the Kiewa Valley. On the spine in gold colour "South * British insurance Company Fire and Marine. Risks Lowest Current Rates No. 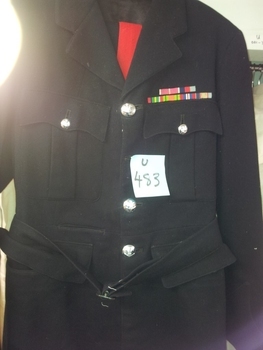 11 Queen Street, Arthur J Masters, Manager" and half way down " *Phoenix* Fire Office of London established over 100 years Annual Income exceeds (pound sign) 1,000,000" underneath "Losses Paid Over (pound sign) 16,000,000" underneath "Reserve Fund Exceeds (pound sign) 1,000,000" underneath "9 Market Buildings William Street, Melbourne " underneath " R. Manfield Taylor, Agent" and at the bottom section" Henry Scott Auctioneer and Estate Agent 49 Bridport St., Albert Park" stamped on the bottom side across the page endings "The Wonderful Wertheim Sewing Machines Swanston Street opposite Town Hall", stamped on the top side across the page endings " The Sweet Hapsburg Pianos & Organs Swanston Street Opposite Town Hall"
Black and white group photograph of 15 men and the Minister at the side of the Church of England Rutherglen. 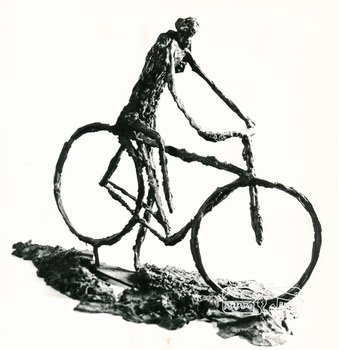 Mounted on cardboard. 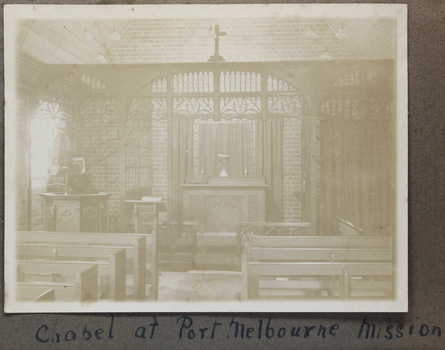 Written on back: "Circa 1923/24. Back row - ___, Farrell, J. Stanton, H. Turner. 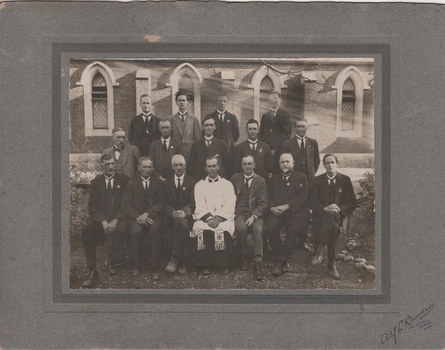 2nd row - G. Barnes, W. Backman, S. Bray, E. Furze, Bert Furze. Front - H. William, Neville, C. Judd, Rev. James Watt, G. Chandler, Mr. Chandler, F. Uren." A metal catheter with a long narrow trocar, used for the removal of mucus, chiefly, from newborn infants. This item belonged to Dr Mitchell Henry O'Sullivan�s (1892-1972) obstetric bag. A small bell shaped sherry glass with a gold Mt Aitken Estates transfer on the front. It has a stem that appears to twist around itself and fans out to a plain base. 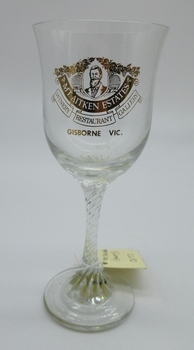 This item was produced for use by the Mt Aitken Estates at their winery, restaurant and Gallery, Calder Highway, Gisborne, Victoria. Year 3A, 1997. Front Row: Ariel Ritz, Cara Friedman, Terri Goldman, Jeremy Wein, Chanelle Kemelman, Alexander Rutman, Ashley Bloom. Second Row: Richard Machet, Adela Woliansky, Jacqueline Krivitsky, Naomi Blashki, Valentine Nrusylovsky, Naom Gardy. Third Row: Edoe Barzilay, Talia Levy, Dana Ochert, Bradley Elias, Jake Smorgan, Steven Shandler, Matthew Danos, Tamara Zimet, Jessie Metz, Jules Rose. 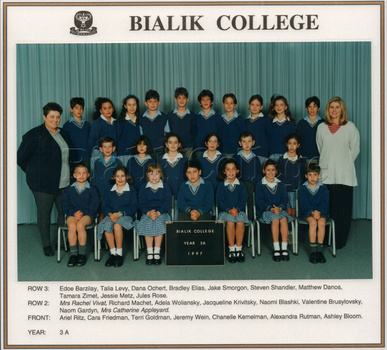 Teachers (second row): Mrs Rachael Vivat, Mrs Catherine Appleyard. Colour photo x 10 of guests at Legacy house. 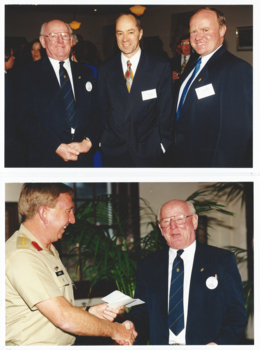 A record of a function at Legacy House in 1998. Printing on the back "<No. > 600" which is the negative frame number and film number. (frame numbers 1A, 3A, 4A, 5A, 6A, 7A, 12A, 14A, 16A, 35A). Yellow Post-it note says: "Media Launch for Legacy Week '98". 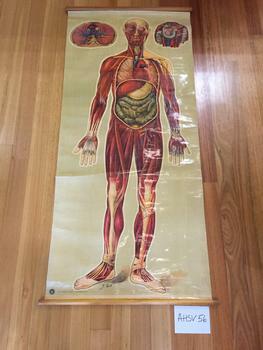 Rectangular medical chart showing the human body, muscles and organs.The chart is made from coated and printed paper on a fabric (?cotton) backing and is attached with metal tacks to timber batons at each end . A strip of red cotton tape is attached to the mid-part of the upper baton and has been used to secure the chart when it is rolled up. Metal ring eyelets are screwed into either end of the upper baton and were probably used to assist when hanging the chart. The artists name 'J.Teck' is included on the lower edge on the front of the chart. The logo of the St John's Ambulance Association and the words 'ST JOHN'S GATE, LONDON E.C. 1' are printed on the lower edge of the chart (left hand side on the front of the chart). The words 'FULL BODY INC LIMBS' is written in black texter pen on the upper baton. The words 'ORGANS, MUSCLES' have been written on the top margin of the chart on the reverse side. A 'Norah Wellings' souvenir sailor doll from the S.S Iberia, blue in colour with a white coloured hat. The fabric doll of a sailor was purchased sometime during a cruise by an unknown person. 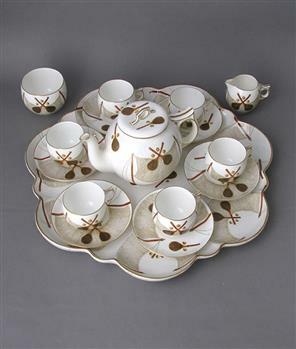 It is part of a cruise liner collection by D. Benson and Family over a period of years. 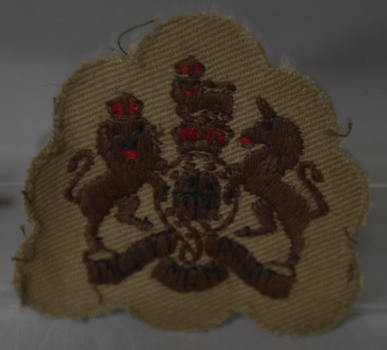 D. Benson sold part of the collection to the V.M.C who purchased the remaining part. 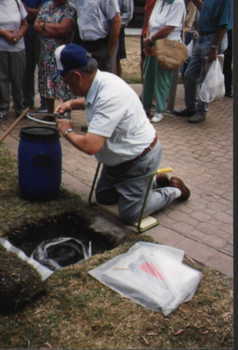 It is a great source of information to visitors to the V.M.C. 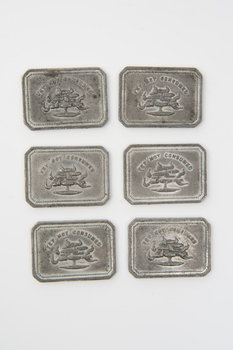 At the time of ocean liner holiday cruising, many people purchased these souvenirs to keep or give away as gifts. A coloured photograph of Stockwell Drive before the asphalt was laid. The photograph is looking north. 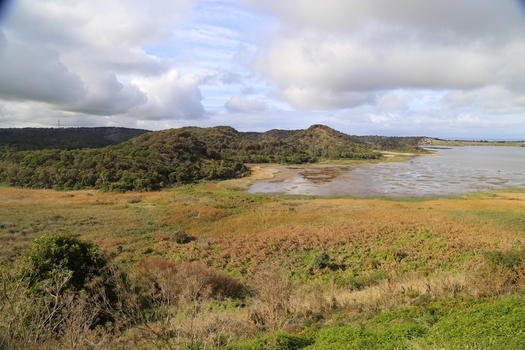 Three gum trees are on the LHS of the photograph. Three people are in the distance riding horses. On 4th August 1978 the construction of the Goonawarra Housing Estate commenced. 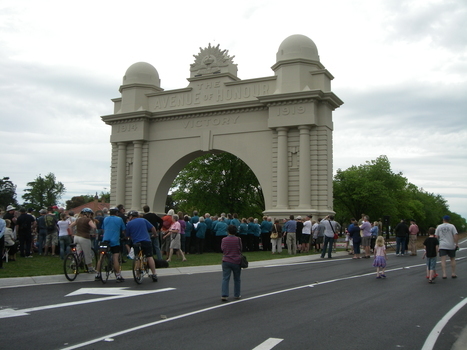 The estate was formerly known as Goonawarra farm and overlooked the Sunbury town area and Jacksons Creek valley. Plans for the new development included a golf course, houses, community and recreational facilities. The golf course opened in 1980 and the housing construction continued throughout the last two decades of the twentieth century and into the twenty first century. Links: 00467:00799 20-page plastic binder, red cover. 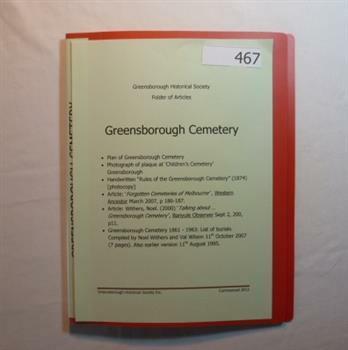 Contains documents relating to the Greensborough Cemetery.. Contents: Plan of Greensborough Cemetery; photograph of plaque at 'Children's Cemetery'; photocopy of 'Rules of the Greensborough cemetery 1874'; Article 'Forgotten cemeteries of Melbourne'; article 'Talking about Greensborough Cemetery, Noel Withers 2000; List of burials compiled by Noel Withers and Val Wilson 2007. 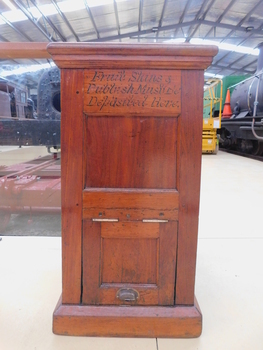 Tin lined wooden box with sign writing on two sides. Fruit skins and rubbish must be deposited here (hand sign written on two sides ). 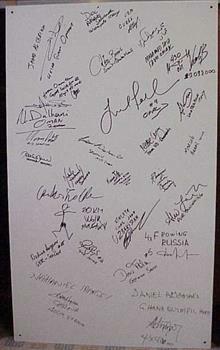 Athletes signature panel from the Woolmark pavilion at the Sydney 2000 Olympic Games. This commemorative signature panel was signed by athletes who competed in the Sydney 2000 Olympic Games. 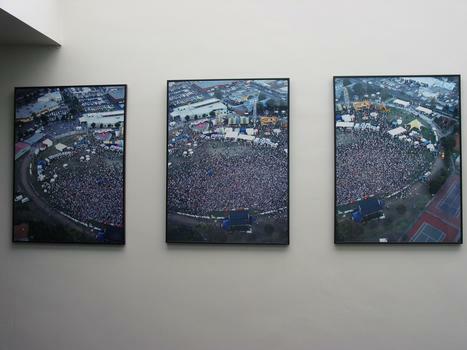 The panels were originally housed in Woolmark Woolshed located in the Expo area of the Olympic Games site during the games. Over 300 Olympic athletes from 25 countries and competing in 20 different sports visited the Woolshed and every athlete who paid a visit was invited to sign the 'Athlete's Wall'.